If you use your iPhone & iPad for work or school, you probably have it with you pretty much all the time. They have proven indispensable and can even help reduce the amount of work of a virtual assistant if you have the right apps, from note-taking to mobile office suites, timers, calendars, and to-do lists. If you’re always on the lookout to make your life easier, then have a look at our favorite productivity apps for iPhone & iPad. 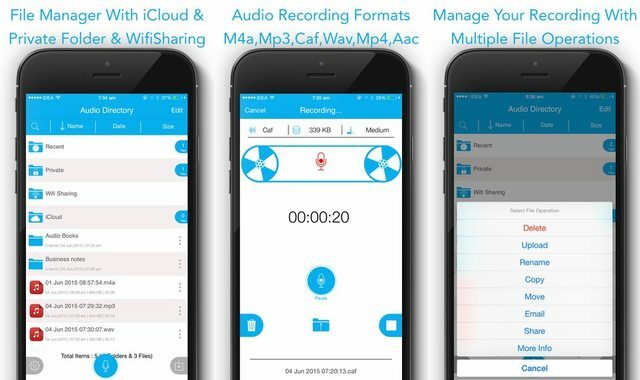 Recorder is an audio and voice memo recording app that makes it easy to take down audio notes and memos on the go. After you make your recordings you can share via the cloud. Record lectures, business meetings, and to-do lists for yourself in different formats like MP3, CAF, MP4, AAC, M4A, and WAV. The interface is straightforward and easy to use, you can record and playback in the background, and you can pause and resume recordings. Playback features include fast forwards, fast backward, and player speed adjust so you can find the perfect playback speed. The length of recordings you can take depends on the storage availability of your device, but if you have the space, you can record for hours.